MK Ayelet Shaked appeals to the board of Haifa U. over decision to reject the degree of Professor Aumann due to his political views. MK Ayelet Shaked (Jewish Home) sent a letter Monday to the office of Ami Ayalon, Chairman of the Executive Committee of Haifa University, and Minister of Education Shai Piron (Yesh Atid), appealing the controversial decision not to grant an honorary doctorate to Professor Yisrael Aumann. 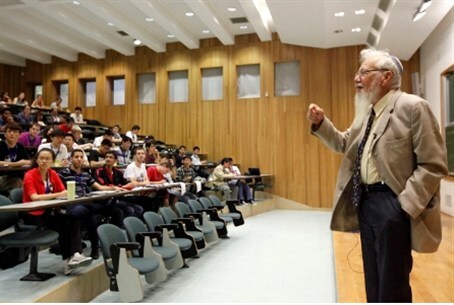 Professor Aumann is a Nobel Laureate in Economics and a noted academic scholar, yet Haifa University chose to reject him - not based on his scholarship, but ostensibly for his political views. Ayalon and other board members decided Sunday to decline the grant of an honorary doctorate to the laureate, on the grounds that his "political views are not in line with University values." Shaked fired back at the claims Monday, pointing out both that Aumann's political views should not be a factor in his academic standing and that other factors in his favor were not taken into account during the review. Shaked added, "It is imperative that academic institutions examine and grant a certificate of appreciation according to the scientific and academic contribution of this candidate - and not according to his political views." She also quoted the words of noted Professor Dr. Haim Shane, who sharply condemned the move earlier this week. "While the State of Israel is fighting on the world's stage against mixing politics and science, the University of Haifa has joined worst enemies of Israeli academia and gave them a boost [...] the decision of the Executive Committee cuts off the very values on which the University was founded." Shaked's imperative echoes similar statements by MK Shimon Ohayon (Likud-Beytenu) Sunday, who vowed to bring the issue to the Knesset plenum. “Every university and research institution should foster scientific research and the only thing that should stand in the way of honoring an individual is a moral flaw or a criminal issue. Judging someone based on his political positions is extreme and extraordinary and should not be done in an academic institution,” he said. Ohayon also pointed out that since Haifa University is funded by the state of Israel, the refusal becomes a national issue. The University has been the site of anti-Israel activity before. In 2012, during Operation Pillar of Defense, Arab students demonstrated in mourning not of IDF soldiers, but for downed terrorist Ahmed Jabari. The university later made a public statement against the incident and banned further student demonstrations. Earlier this year, terror victims' advocacy organization Almagor publicly spoke out against the university for providing legal aid to convicted terrorists.